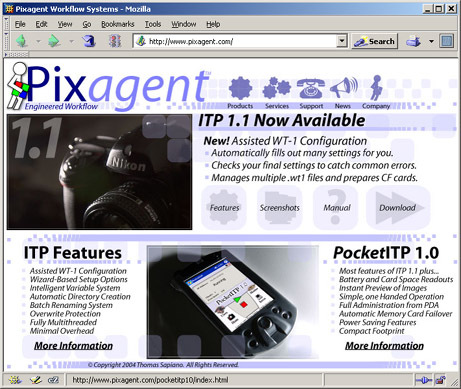 Toronto, ON - June 3rd, 2004 - Pixagent Workflow Systems is happy to announce that our all new website is now available to the public. In addition to providing detailed descriptions of our powerful workflow-oriented products, we are offering a new online WT-1 configurator. This script provides visitors with the ability to quickly and easily produce configuration files for the Nikon wireless transmitter regardless of the computer platform that they are using. To help simplify the process, our online configuration system alows users to click on any field in the form to retrieve a detailed description of the entry as well as how to figure out what is best suited to their configuration. In addition, we have added a simplified version of the form that can be used in simple network configurations to help users who may not be familiar with the intricacies of wireless networking. In addition to providing the configurator, we have also included a simple debugging guide to help people who are having trouble getting their transmitter working. Once a user gets all of the settings loaded into his camera and experiences a connection failure, trying to figure out which of the WT-1's many settings are causing the problem can be a frustrating exercise. This guide helps users through the process of identifying and solving the problem. Using simple animated GIFs, it helps users to utilize the three LEDs on the transmitter to help find the source of the failure. Once the type of problem is isolated it is much easier to figure out exactly which setting is at issue. These systems are part of Pixagent's continued desire to help make the Nikon WT-1 wireless transmitter easier to use. Our ITP 1.1 product provides its users with an even more powerful system that will automatically retrieve most of the configuration details on it's own. Furthermore, both ITP and PocketITP provide easy to use, yet powerful workflow-oriented FTP servers that vastly simplify the process of configuring your computer to work with the transmitter. Unlike other packages our products are designed specifically for Photographers and contain a wealth of features to help optimize your workflow. Together, this growing suite of products is intended to make the use of wireless image transmission as simple as conventional wired techniques. Wireless transmission equipment like the WT-1 has provided photographers with the potential to significantly optimize the efficiency of their workflow. Pixagent is committed to unlocking all of that potential power to help users to spend less time sitting in front of their computers and more time in the field taking pictures. The new WT-1 configurator and debugging guide are available now within the support section of this website: http://www.pixagent.com/support/! Over the next few months, we assisted many people in setting up their WT-1s on both Windows and Macintosh platforms. As such, we saw many issues that people had problems with and looked for methods to work around them. ITP 1.1 was released (March 16th, 2004) in an effort to help remove many of the stumbling blocks that caused people problems and was highly successful in making the experience of setting up the WT-1 simpler for many users. This system is a followup of that effort, extending WT-1 configuration to any system that can access the internet. While not as powerful as the system in ITP 1.1, it is much easier than manually entering all of these settings. We aim to make the configuration of this device as simple and intuitive to setup and use as people are used to with traditional photographic equipment.